A few days ago, Lindsey (Noodle Nights and Muffin Mornings) posted this recipe on the What’s Cooking board. They looked so good and she raved about them so much that I decided to try them myself. I am so glad I did! 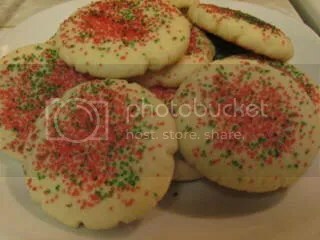 This really is a great classic sugar cookie recipe. 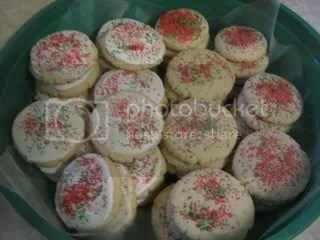 I added royal icing to some of them and I finally managed to make a cookie that compared to the iced sugar cookies that Scott has always talked about that his Aunt Barbara used to make. Yay! Directions:In a large bowl cream butter and sugars. Beat in eggs one at a time, until mixture is light. Gradually add dry ingredients to the creamed mixture and beat until blended. Wrap dough and chill for several hours. Roll into balls and place on greased cookie sheet. Flatten dough with the bottom of a glass dipped in colored sugar. Bake at 325 degrees for 8 to 10 minutes, until just set. Let stand on cookie sheet before two to three minutes before removing. For Royal Icing with Meringue Powder: In the bowl of your electric mixer (or with a hand mixer), beat the confectioners’ sugar and meringue powder until combined. Add the water and beat on medium to high speed until very glossy and stiff peaks form (5 to 7 minutes). If necessary, to get the right consistency, add more powdered sugar or water. 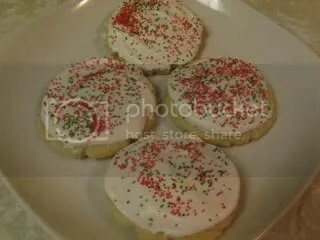 To cover or ‘flood’ the entire surface of the cookie with icing, the proper consistency is when you lift the beater, the ribbon of icing that falls back into the bowl remains on the surface of the icing for a few seconds before disappearing. Add desired food coloring. Great story!. 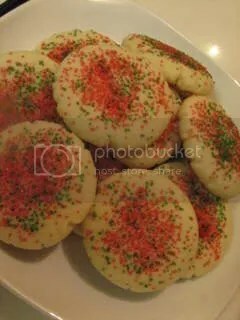 I also tried this recipe and the cookies were great! Happy Holidays.